Super simple car-sharing service car2go has launched in the capital this week, bringing a fleet of smart cars to Londoners who want to get around but don’t want the hassle of looking after and paying a small fortune for their own wheels. The car2go service from Daimler and Europcar works a bit like the popular Barclays “Boris bikes” we’re all so used to seeing whizz around London. You register with car2go and you’re sent a membership card, you then locate a car and activate it by swiping your card against the reader on the window, drive it around as much as you like and then return it to any “Home Area”. As we’re such geeks here at Shiny Shiny, we were really happy to hear that there’s an app to makes the whole process even easier too, allowing users to locate the nearest available car2go car wherever they are. The service is already popular in 16 cities across the globe and it’s now here in London after being initially rolled out to the boroughs of Islington and Sutton to begin with. That’s essentially what’s made Boris bikes such a staple part of London transport. It’d be great to have a car, bike or even some crazy helicopter all the time, but we’re busy, we don’t have much space and wow can us Londoners drink, so we’re just broke most of the time anyway. As you’d expect car2go isn’t dirt cheap, it’ll cost you 35p per minute to drive around the city, which will be billed directly to your account. But for the odd important journey and taking your Christmas shopping home without losing the will to live on the bus, it’s totally worth it. 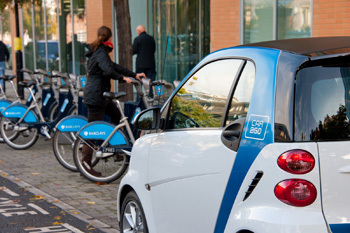 There are a number of similar car-sharing services available, especially here in London, but car2go is arguably the most user-friendly, allowing you to just swipe in and out of cars when you need to with ease. Of course we don’t imagine every Londoner will be battling for the car2go vehicles from the word go as much as they did (and still do) for the Boris bikes, but for one-off journeys they’re a perfect solution and much cheaper than owning an actual car. Until the end of this year customers can register for car2go and get 30 minutes of driving loaded onto their accounts, so if you’re interested sign up soon.